As I said, here is the post of my Pier 1 finds that I was so excited about. 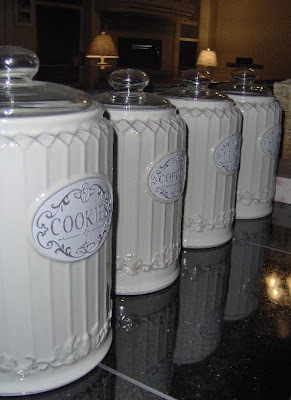 They are charming little jars to go on my kitchen counter. They fit my decorating style perfectly!! I would like some feedback though. I'm not going to store the things that are labeled on them. I already have a satisfactory Tupperware storage system for my baking goods like flour and sugar. What useful items I can store in these jars? I always like to make my decor serve a useful purpose if possible. 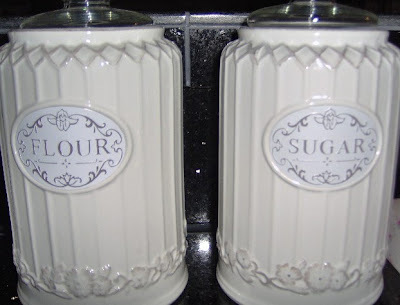 I would be interested to hear your clever ideas on what I can keep in these romantic-looking kitchen jars. You are going to think this is so gross, but I got some cute containers to put my flour and sugar in from Pottery Barn, and they have these cute little wooden spoons that hang from the side, well...the other day I caught my cat up on the counter licking the sugar spoon to pieces! : P You are a cute decorator! i love the cat licking story above! lol. and Dorey had a lot of ideas too! little things that need a place. and they are cute! i love finds like this, dont you? lisa, do you have Home Goods near you? have you ever neen to one? Lisa, I too have a pretty set of canisters that I do not use for their "intended Purpose" I use my medium size on as a utensil caddy so my spatulas are next to the stove and ready at a moments notice if I need to quickly grab one!